Parkstad Limburg Stadion is a purpose built football ground which has a capacity of just under 20,000. First opened in the Summer of 2000, the stadium is home to Roda JC who are based in the city of Kerkrade in southern Netherlands. The inaugural fixture of Parkstad Limburg Stadion was played on 15th August 2000 between Roda JC and visitors Real Zaragoza from Spain. Attended by a full capacity crowd, the entertaining 2-2 draw certainly christened the new stadium in style ahead of the 2000/2001 Eredivisie season. To date the record attendance is set at 19,300 after Roda took on AC Milan in a knock-out match of the UEFA Cup on 21st February 2002. This is in contrast to a group match against Icelandic side Fylkir back in September which only attracted a crowd of 2,500! In the Summer of 2005 Parkstad Limburg Stadion hosted several matches of the FIFA World Youth Championships including the opening match of the tournament and crucial semi-finals. The 15th edition of the tournament was hosted solely by the Netherlands and won by Argentina who defeated Nigeria in the final. Pictures of stands coming soon. 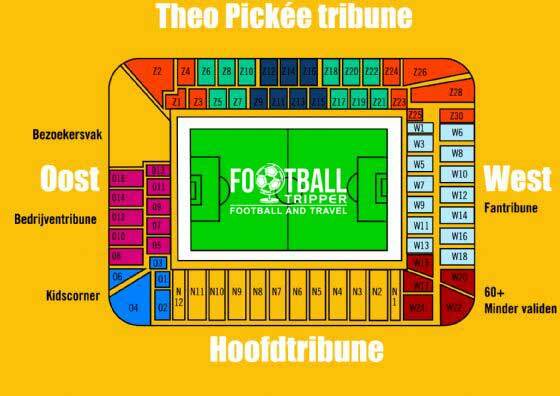 Away fans are housed in the southernmost section of the Oost (East) stand marked on the above seating plan as the “Bezoekersvak” which translates into English as visiting stands. There is a burger king 2 minutes west of the stadium which predictably gets exceptionally busy on matchdays. As it doesn’t appear as if Roda JC currently have an online fanshop, the best place to purchase official merchandise of De Koempels (The Miners) is from the fanshop located at the stadium next to the main entrance of Parkstad Limburg. It doesn’t appear as if any tours are currently available of Parkstad Limburg Stadion. If Roda JC ever begin to offer tours, we’ll be sure to update this section. Tickets to see Roda JC in action at home can either be purchased online in advance of the match or in person from the fanshop in the days leading up the match or before kick-off from the ticket offices. Please note that for the highest profile matches against the big three (PSV, Ajax and Feyenoord), prices can increase between €2.00 – €3.50 in order to offset the demand. Tickets are still incredibly reasonable however! Parkstad Limburg Stadion sits 6.1 km west of what Google maps defines as the centre of Kerkrade. Located very much in an archetypical out of town area with poor public transport links, the majority of Football Trippers end up catching the bus or getting a taxi. The main entrance of Parkstad Limburg Stadion. There are over 2,000 on-site parking spaces available at Parkstad Limburg Stadium spread across seven car parks. Follow the signs once you get to the stadium to find the unreserved parking areas which operate on a first-come first-served basis. The city of Kerkrade is served by no less than four railway stations although Kerkrade Centrum and Chevremont are generally regarded as the two most important due to their proximity to the town centre. A sign for Kerkrade Centrum – Central Railway Station. The stadium and its adjacent roads are specifically served by bus numbers 27 and 43 however the five minutes away the roundabout just off of Euregioweg has stop called “Parkstad Stadion Perron A” which can be reached by the 28, 41, 43 and 44. The closest international airport to Kerkrade is Maastricht Aachen Airport 32 km west of the city centre. The two next closest airports are Liege in Belgium (69 km), and Cologne Bonn Airport (98 km), however Eindhoven is only 113 km away so is still worth considering. Within the stadium complex itself there is the four star Golden Tulip however it’s suitability depends entirely on whether or not you a) have the budget and b) want to stay near the stadium. Back towards the train station along the main Kaalheidersteenweg road there is De Zevende Hemel and the Fletcher Hotel but besides these two there aren’t really any other options within walking distance.